Strikers at the gate into Labor Camp; 2, where they live during the picking season. BURLINGTON, WASHINGTON -- Filemon Pineda traveled a thousand miles to northwest Washington to pick strawberries and blueberries, as he's done for three years. He left Santa Maria, California, in April, got picking jobs for himself and his wife at Sakuma Brothers Farms, one of the state's largest berry growers, and was assigned a dilapidated cabin in Labor Camp 2. He bought a cheap bunk bed, and the company gave him some ancient mattresses, one even wrapped in an old black plastic sheet. His three small children slept together on one bunk, while he spread the other mattresses on the concrete floor, which he covered with carpet samples. When he went to work, though, he found he wasn't making enough to survive the coming winter, once the family returned to California. He and his coworkers in Camp 2 stewed over their problems for several months. Finally, in July, they'd had enough. When the blueberry picking started, the company fired Federico Lopez on July 10 for asking for a wage raise, and workers went on strike on July 11 to get his job back. They organized a committee, Families United for Justice, and later formulated a list of demands that included wage raises and improvements in conditions in the labor camp where they lived. Sakuma Brothers Farms has two labor camps - temporary housing for migrant workers during the picking. Over 200 families live in Camp 2. Lopez was rehired on July 15, and workers returned to their picking jobs while they continued to negotiate with the company. On July 20 they struck again, accusing the company of lowering their piecerate wage. On July 26 they went back to work, while continuing to talk about wage increases. Company picking records showed that 248 workers had participated in the strike - the vast majority of the 278 working at the time. In the course of these negotiations, however, the workers discovered the limit to any improvements they could expect. Sakuma Brothers Farms had made an application with the Department of Labor for 160 H2A guest workers in April, which a labor contractor would hire in Mexico, and bring to the farm in August to pick late blueberries and blackberries. 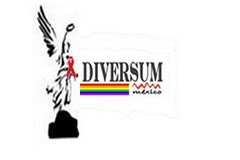 "They negotiated with us, which was a big achievement," explains Rosalinda Guillen, director of Community2Community. The farm worker advocacy and organizing project she heads in northwest Washington was the workers' key source of support. Guillen concluded, however, that the main reason the company negotiated was fear that their application for H2A workers would be suspended because of the strike. Federal regulations prohibit employing H2A workers if a labor dispute exists at the employer. According to Nina Martinez of the Latino Civic Alliance, a group of Washington state Latino political activists, the Department of Labor only lifted a suspension on Sakuma's application when workers returned to work on July 26. "That's why Sakuma negotiated," Guillen believes. "They had to end the labor dispute." The H2A program was established in 1986, to allow U.S. agricultural employers to hire workers in other countries, and bring them to the U.S. In this program, the company first must certify that it has tried to hire workers locally. If it can't find workers at the wage set by the state employment department, and the department agrees that the company has offered the jobs, the grower can then hire workers outside the country. The U.S. government provides visas that allow them to work only for this employer, and only for a set period of time, less than a year. Afterwards, they must return to their home country. If they're fired or lose their job before the contract is over, they must leave right away. Growers must apply for the program each year. In the past, Sakuma Farms relied on local workers and migrants from California, like Pineda's family, to fill its 7-800 picking jobs at the peak of the harvest during the summer. This is the first year the company has applied to bring in H2A workers. The company's use of this contract labor program supports accusations made by critics over the years - that guest worker programs hold down wages. With Congress debating vastly expanded programs like H2A, this impact could become much more widespread, and even determine the overall wage level for other workers in agriculture and industries heavily dependent on immigrants. According to a report by Farmworker Justice, a farm labor advocacy group in Washington D.C., "Guest worker programs drive down wages and working conditions of U.S. workers and deprive foreign workers of economic bargaining power." Sakuma Brothers Farms is owned by a family business, Sakuma Brothers Holding Company, which has annual sales of $6.1 million. The family has farmed in the Skagit Valley for decades. During World War Two the Sakumas were interned because of their Japanese ancestry, and would have lost their land, as many Japanese farmers did, had it not been held in trust for them by another local rancher until the war ended. Today the business has grown far beyond its immigrant roots, and is one of the largest berry growers in Washington, where berries are big business. The company considers itself "vertically integrated," owning a retail outlet, a freezer and processing plant, and a chain of nurseries in California that grow the rootstock for strawberry plants for its own operations, as well as those of other growers. By contrast, Sakuma workers had very few resources. They struck twice, until many families had no food left, and the hot dog lunch brought in by local community supporters became their main meal of the day. The striking workers felt threatened by the impending arrival of the H2A workers. "That's why we're fighting," Pineda said. "I want to come back next year - I need to work. But I'm worried that when we come back the H2As will be here. Sakuma says there aren't enough workers, but here we are, and he doesn't want to pay us fairly. He told us, 'There's the field. If you want to work, ok. If not, get out of the camp.' He doesn't see us as important people." Added one young striker, 18-year old Teofila Raymundo, "I've seen them treat my dad bad, but he comes back because he needs this job." Strikers were motivated as much by discrimination as they were over wages. Most strikers come from towns in Oaxaca and southern Mexico where people speak Mixteco and Triqui, indigenous languages that predate the Spanish colonization. Bernardo Ramirez, who heads an organization of indigenous Mexicans, the Binational Front of Indigenous Organizations, traveled from Oaxaca to support them. "Foremen have insulted them, shouted at them and called them 'burros [donkeys],'" he charged. "When you compare people to animals, this is racism. We're human beings. 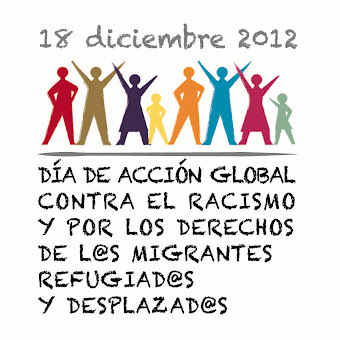 Low wages are a form of racism too, because they minimize the work of indigenous migrants." With the blueberries in danger of getting overripe before the guest workers arrived, the company sat down and talked. In addition to rehiring Federico Lopez, the Sakumas discussed other problems, and resolved some, like replacing the ancient mattresses in the camp. But when it came to wages, "the H2A rate limits what's possible," Guillen says. "The workers asked for $14/hour but had to accept $12 because that's what the workers who were coming would get." The company pays a piece rate, and guarantees that workers will earn at least the hourly wage. Workers were demanding an improvement in both - a $14 hourly guarantee, and a minimum price of $6 a box. The company would not pay more than $4 a box, and a $12 per hour guarantee, saying that the higher demand would raise its labor costs too much. When workers work at a piece rate, they earn according to the number of boxes they pick. If the field is bad or they don't pick fast enough, a guaranteed rate ensures that they still make a set minimum per hour. They also wanted a higher piece rate - $6 instead of $4 per box. People who pick quickly would earn a lot more. Twelve dollars sounds like a lot for farm labor, which often pays close to minimum wage. But workers have only a few months to earn enough to support large families through the winter, when work is scarce and they have to live off their savings. According to one striker who's worked at Sakuma Brothers Farms for five years, Lucia Martinez, "by December our money has run out, and we have to get loans to survive." Sakuma's application for H2A workers became very controversial in the small towns of Skagit Valley. The company justified it, saying it faced a labor shortage that led to the loss of blackberries last year, and strawberries this year, when it said it couldn't find enough workers to pick them. But the farm was also unwilling to raise its wages to attract additional pickers. "If we [do], it unscales it for the other farmers," says Ryan Sakuma, who manages the operation with his father and brothers. "We're just robbing from the total [of workers available]. And we couldn't attract them without raising the price hugely to price other growers out. That would just create a price war." Ryan Sakuma says he faces pressure on prices from customers, especially ice cream companies, which keeps him from raising wages. "[They] can get berries cheaper in California...There's competition from Mexico too." He pegged his farm's wages to the H2A program: "Everyone at the company will get the H2A wage for this work." The government sets the H2A wage state-by-state at a level that supposedly prevents employers from using guest workers to undermine local wage levels. Washington State has one of the highest -- $12 this year, $10.47 last year. In other states it's very close to the minimum. The use of guest workers in agriculture could grow rapidly if the immigration reform bill passed by the Senate earlier this year becomes law. S. 744 would replace the H2A program with a new, expanded guest worker program. The maximum number of visas available in the first five years of the new program would reach 337,000. In 2012, the U.S. Department of Labor certified 85,248 H2A visas. Some workers in the new proposed program would be allowed to move from one registered employer to another, and stay longer than a year, but would have to leave if they were not working. States would no longer certify growers' claims they'd tried to find local workers, nor would they set wages. Instead, the bill sets a national wage for various farm jobs. For the kind of work performed by the berry pickers at Sakuma Brothers Farm, that wage would be $9.64 per hour. That is $2.34 below the guest worker wage set by Washington State this year, and is only 45¢ above Washington's minimum wage of $9.19 an hour. The current H2A program requires farms like Sakuma to provide housing, and the company planned to house its H2A workers in one of its labor camps. In the Senate bill, however, growers could give workers a housing subsidy instead of actually supplying housing, leaving them on their own to find an actual place to live. In the small towns of Skagit Valley, as in most agricultural areas, that would be difficult because there is little housing available for migrant families. Interest in bringing in H2A workers has grown rapidly in Washington State, and some local activists feel growers are preparing to implement much larger programs if Congress enacts a reform like S. 744. A decade ago there were no H2A workers in Washington. Last year the U.S. Department of Labor certified applications for 7,086 workers, more than double the 3,194 of the previous year, making the state the third highest nationally after North Carolina and Georgia. The nation's second largest contractor for those workers was the Washington Farm Labor Association, with 2,293 workers -- the contractor used by Sakuma Brothers Farms. In eastern Washington in 2010, the U.S. Department of Homeland Security forced Gebbers Farms, a large apple grower, to fire 550 workers because they had no legal immigration status. Gebbers was then certified to bring in 800 H2A workers from Mexico, and 400 from Jamaica. Before filing his own application, Ryan Sakuma traveled to the Yakima Valley, a large agricultural area in central Washington where other employers have begun to use the H2A program, to hear their experiences. He says he's not worried about the kind of immigration audit the government did at Gebbers, but his father Steve said the family was worried about another part of the Senate's immigration reform, that would require employers to check the immigration status of all their workers using a database called E-Verify. "We worry about E-Verify," he said. "Maybe 70-80% of farm workers wouldn't get through. And if you eliminate 70-80% of the workforce, growers are in trouble." According to the U.S. Department of Labor's National Agricultural Workers Survey, over half of the nation's farm workers are undocumented immigrants. 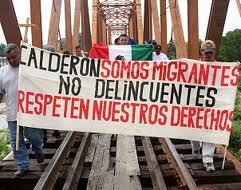 Nevertheless, with or without legal status, farm workers organize and go on strike often. 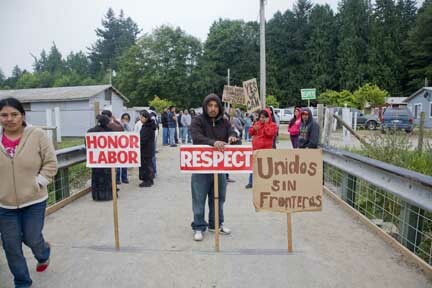 Ironically, the controversy over H2A workers at Sakuma Brothers Farms and elsewhere pits immigrant guest workers from Mexico against immigrant Mexican workers already living in the U.S. "We know they need jobs too, but all we're asking for is a fair wage," said striker Marcelina Hilario. Workers struck previously at Sakuma Farms. "In 2004 there was a strike, and they began to pay better, $6 a box," said Pineda. "But the price only lasted that year, and then they went back to the way it was before." Strikers wanted overtime pay this year as well - farm workers are excluded from overtime protection under both Federal and Washington state laws. They didn't get that either. They were successful, however, in giving the daughters of some pickers access to jobs checking the weight of the boxes picked by workers - easier work than picking. The company previously had hired local students on summer break, mostly white, for those jobs. The pickers' daughters wanted to be considered as well. "They always gave those jobs based on favoritism," alleged one, 18-year old Marcelina Hilario. In negotiations, she and her friends got them. Other young people working with their parents had accused the company of paying them less than minimum wage. "One check I got came out to $148 for working for five days. I was working all day, even when it was raining," said 13-year old Rosalba Raymundo. The company promised to investigate and rectify those complaints as well. In Washington State, teenagers are permitted to work in the fields during schools' summer break. Guillen believes the use of the H2A program undermines the wages and conditions for workers like the strikers. She worries even more about the Senate bill and Congressional proposals to expand guest worker programs. "They devalue farm work," she charges, "and view workers just as a source of profit, instead of skilled people in a profession that can sustain families. Their whole philosophy is 'anyone can do it.' The company sets the price, pays what it wants, and then sends them back to Mexico. Workers have to accept whatever the company gives them." Bernardo Ramirez says Congress' plan for guest workers is raising doubts in Mexico as well - the country from which both the strikers and the guest workers are coming. "We don't think a guest worker program will make life better for people in either Mexico or the U.S. Sakuma wants to bring in these workers because he's not willing to pay a just wage to the people already here." Striker Lucia Martinez doubts this situation will change. "I have two daughters," she said. "I don't want them to work in the field like me." With Solange Echevarria of KWMR about growers push for guest worker programs. Advance to 88 minutes for the interview.